The discovery of a new frog species in New Guinea is pretty big, but the frogs aren't. The newly found frog species, Paedophryne amauensis, is the world's tiniest known vertebrate, according to a press release from Louisiana State University. 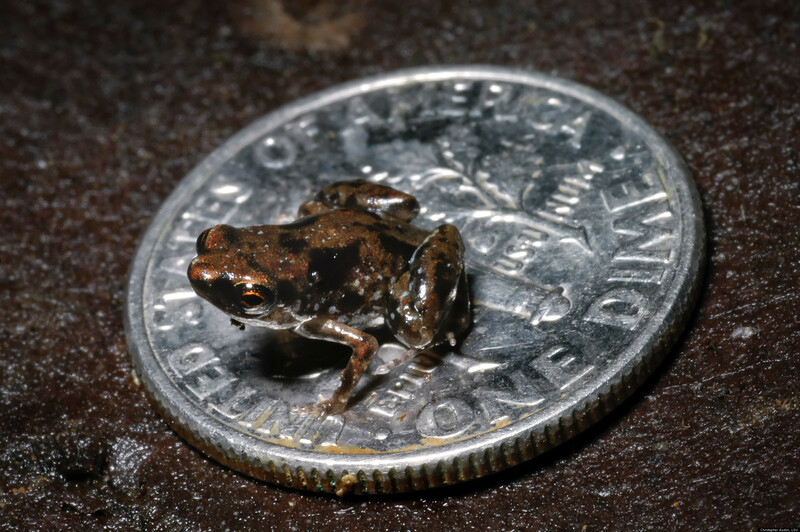 Averaging less than one-third of an inch (7.7 millimeters) in length, the frogs are able to fit in the center of a U.S. dime. Published Wednesday in the journal PLoS ONE, the discovery was made by a team of American researchers led by Louisiana State University herpetologist Chris Austin. Austin said in the press release, "It was particularly difficult to locate Paedophryne amauensis due to its diminutive size and the males' high pitched insect-like mating call. But it's a great find. New Guinea is a hotspot of biodiversity, and everything new we discover there adds another layer to our overall understanding of how biodiversity is generated and maintained." Paedophryne amauensis steals its tiny crown from Paedocypris progenetica, an Indonesian fish that averages over eight millimeters in length. It also beats out two other Paedophryne species which were discovered in New Guinea in December as the world's smallest tetrapod, or vertebrate with four limbs. Paedophryne dekot and Paedophryne verrucosa both average under 10 millimeters in length, according to National Geographic, but they are larger than Austin's new frog. The discovery was a challenge for Austin and his team, but a frog's life may be a little more difficult. A report from 2011 found that the demand for frog legs is driving some frog species to extinction. The global frog trade is also reportedly causing the "spread of a fungus called chytrid, which kills frogs in droves along with other amphibious populations." 208 new species -- including several frogs -- were discovered in Southeast Asia in the past year, but they are threatened by "habitat loss, deforestation, climate change and overdevelopment," according to the World Wildlife Fund. Click here to listen to the new frog's mating call. Check out an image of the frog below and scroll down for video.